Whether you manage a successful business in the energy sector, the biotech sector, manufacturing, retail, hospitality, education… whatever your niche—you probably have assets and equipment that have outgrown your facilities. You might even have satellite campuses or field sites that require people and resources, but don’t warrant a new commercial lease or long-term construction. Generic storage trailers are great for the companies that supply them, but less than ideal for the thousands of unique businesses that can’t simply stack supplies or inventory inside an open space. Depending on the contents in question, storage units may need to be climate-controlled, ventilated, equipped with custom shelving or hanging racks, etc. Specially designed egresses are also an issue for large components or storage situations that require secure/monitored access. Modified shipping containers are the ideal alternative to unsightly, one-size-fits-all trailers. They’re still cost-effective and portable, but they can do much more to protect valuable equipment. And with custom exterior modifications, they can also help prevent that local fines or public perception issues that eyesore trailers incur. You wouldn’t move your corporate headquarters into a giant warehouse without investing in some expert space planning and design services. Your mobile teams and annex employees should get the same treatment—and not just for the sake of being fair. In various studies, workplace design has been shown to have an effect on employee productivity and organizational performance. Cramped or cluttered environments have a negative impact on satisfaction levels, as well. So before you buy off on a factory-built modular unit—even one with the so-called benefit of “interchangeable” parts—think about how much time your associates will be spending in the structure. Think about solutions that can be built up, out, and custom-finished inside, so that workflow efficiencies and morale are never sacrificed. Essentially: think about modified shipping containers, instead. Not long ago, dozens of “boomtowns” were cropping up around oil basins in North Dakota, Texas, California, and all across the U.S. Today, with crude barrel prices falling, full-scale production in some of these regions doesn’t make financial sense any more. And the housing crises that oil and gas companies struggled to resolve for on-site employees have all but reversed. Vacant lots outnumber workers seeking residence in many locations. Oil production and spending freezes underscore the transient nature of the business—and of drill sites, in particular. They also help to illustrate why expanding local infrastructure (with hotel builds and housing developments) doesn’t pay off for towns, cities, or energy employers. When it comes to oil and gas workforce housing, employees need something tougher and more substantial than a winterized RV, but less permanent than a strip of condominiums. 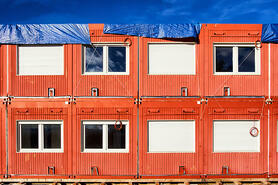 Shipping container housing fits the bill. Before firefighters can tackle an actual emergency, they receive extensive training in facilities known as training towers or burn rooms/buildings. While these structures can be modified to simulate a variety of conditions, the underlying makeup must be incredibly strong, durable, and safe. Similar structures are needed to prepare military teams, hazmat professionals, police, FBI, even workplace safety teams. Modified shipping containers are the logical solution for many of the organizations above. In fact, we’ve completed some very cool projects for military units and other security teams, using conjoined/stacked shipping containers. Projects include C-IED training lanes, urban operations training sites, and after-action review packages. Ready to see what else modified shipping containers can do? Or are you trying decide if a container could replace your portable business structures? Check out our catalog.